Permalink: Come on, kill me! I came to kill Negan. And you're already worse than dead. That settles it. Permalink: I came to kill Negan. And you're already worse than dead. That settles it. 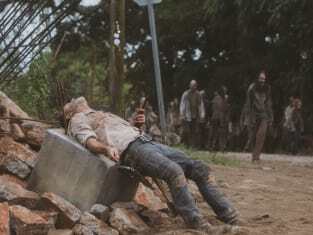 Rick: I'm tired, Hershel. My family... maybe I can find them here. Hershel: No rick, you have to wake up. Permalink: No rick, you have to wake up. Rick: It feels like it's ending. Sasha: Little things do end. But it's never the end of everything. Because we don't die. It's not about you, or me, or any one of us. It's about all of us. It's not over. We don't die. Permalink: It's not over. We don't die.